In 2002 I decided to begin researching my family history. What encouraged me was the excellent work that Patricia Golder nee Hunter (1924 - 2015) had achieved with the publication of her book on the Golders of Upper Hutt and Hukanui (1840 - 2000) and the special project that was being researched by Dr. Brian Opie at Victoria University on William Golders (1810 - 1876) poetry, my gggrandfather. There were some obvious gaps and as I had some spare time, I had an opportunity to start researching and discover more. It was not long before I got hooked and all of a sudden I was in contact with related family members in Scotland, England, Canada, USA and Australia. As at 1 June 2006, I had around 6,000 names in the family tree but today in 2016 it has grown to over 14,000. I have also researched some of the spouses who married a Golder. I have now started to upload it all online at a website Geni website where others can update and share information also. The information on living people is hidden unless you join and are part of that family. Youu can join for free but it does restrict your updating. Currently in 2016 there are over 104 million people in the geni family tree. 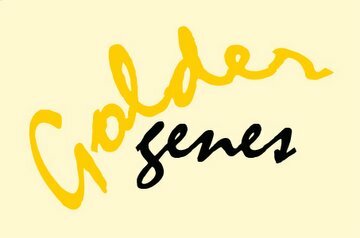 I have discovered the Golder family genes from family records, discussions with relatives and searching various genealogy websites on the Internet. There have been many websites visited but the Scotlands People website has been the most productive for the location of Golder birth, marriage, death and census records in Scotland prior to 1900. Images of these BMDC have been found and downloaded and they provide details of individuals, parents as well as dates and places of births, marriages and deaths. There are a few that I have yet to completely link together but patience will bring the puzzle together in time. From the Scotland Peoples website I have downloaded the basic details of all BDM and Census records into a spreadsheet which has allowed me to create a more meaningful database of information for each person (e.g. date of birth, age, date of death, parents, spouse, whether linked to our family etc) to enable the linking of individuals to parents and spouses etc. I have also included the different spelling of the names as Golder, Goldar, Goldart, and Goulder and now more recently Gauder, Gouder and Gawder prior to 1700. This spreadsheet contains over 3,000 records of the Golders, in Scotland. I am also subscribed to various message boards/forums of some surnames that have uncovered more information and introduced me to other relatives or people searching the same names. I receive approx. 50 emails per day from these forums and the majority are immediately deleted, as they have no relevance to my research. However, it has been a good source for obtaining assistance on where to search for information with many tips on how others are searching for family information. I have been quite surprised at the levels of help provided - some people will visit gravesites and tell me what actual details exist and some have even sent photos. Message boards for areas include: - Lanark, Midlothian, Glasgow in Scotland along with Durham in England for the name Golder and many other spouse names of Golder marriages. I have also left messages on other boards, surnames of spouses, in my research of connections to the Golders. In 2004 I created this website of family genealogy. It was later extended to include the Golder Cottage Museum. Written by William Golder (1844-1924) probably about 1893 when his father Robert Golder (1816 - 1893) died. William Golder (1721 - 1785) of Grange was Robert Golders (1816 - 1893) grandfather. William Golder (1767 - ???) their eldest son was fathers uncle whose youngest brother was James Golder (1778 - 1828) who was Roberts father and who became a soldier at Paisley, who also rose to sergeant James Golder of 91st regiment, whose 4th son was Robert Golder born at Edinburgh castle on 27 May 1816. And his father Sergeant James died after he was discharged a few years, in the year 1828, at Flemington, Strathaven, when his 4th son Robert being 12 years of age he as well as his other brothers learned to be weavers. His youngest brother Angus died at the age of 21. William (1810 - 1876), James (1814 - 1875), John (1812 - 1888), Robert (1816 - 1893) , Matthew (1818 - 1887), Quintin (1822 - 1885), David (1825 - 1888) and Angus (1827 - 1848). William Golder (1749 - 1785) of Grange Farm his eldest son (also named William 1767 - ???) and his son (had three - William (1797- ??? ), Quintin (abt. 1800 - bef. 1868) and John (1803 - ???) - may have been John as I dont know what	happened to him but the other two did marry in Scotland being the nephew of Sergeant James Golder or Robert	Golders	cousin had went to America, because he did not do that which was right in the eyes of the public, had failed went to drink and had lived a miserable life, so lost his farm and left for America being as I suppose in debt. Father (R.G.) told us that when Sergeant James Golder who was discharged from Edinburgh asked his wife Janet	Gardner (1774 - ???) whether shall we go to Paisley or Strathaven, so was our Grandmothers wish to go to Strathaven where they were all brought up in the faith of the gospel under the ministry of Rev. French and Rev. McLay ministers of the Relief Church. Miss Marion Semple (1735 - 1778) was the wife of this first William Golder (1721 - 1785) of Grange who was Roberts Grandmother and was the daughter of the Semples of Freestone Farm (I have found on an old map the there was a farm named "Threestanes" that is close by to Grange Farm - interesting to note that Semples still live there and own this farm - x a local in Strathaven- I therefore think it actually was Threestanes) up to the right of Letham Road where stands a tree that my father (R.G.) used to enjoy his young days while sitting	on its broad branches at the Freestone Farm where this tree stands to this day. So this William Golders youngest son was James who joined the Army after he learned the weaving as all his brothers and uncles were weavers trade being in its briskest time. So after a while my Grandfather went to Paisley Barracks where he became acquainted with a servant girl named Janet Gardner who was a cotton spinner of Lanark Mills, then removed to Paisley he was partner of the mills in Thread Street as a cotton spinner in Paisley. There the above Janet Gardner was married to James Golder sergeant of the 91st regiment who after a while service abroad had been returned to Edinburgh Castle. There he kept garrison of the Castle till he was pensioned off with a pension of 7/6d. a day but it was Strathaven man who became a minister and was placed in Paisley Old Relief Church the Rev Thomson who married my Grandfather James Golder and Grandmother Janet Gardner in Paisley Barracks and by their marriage 8 sons were born viz William (1810 - 1876), James (1814 - 1875), John (1812 - 1888), Robert (1816 - 1893) called after Robert Gardner his Grandfather of Paisley. Then there was Matthew (1818 - 1887) and Quintin (1822 - 1885) and David (1825 - 1888) and Angus (1827 - 1848) who died at the age of 21 years. Then James Golder died in 1828 and left a widow and 8 sons. So Grandmother (Janet Gardner) got married to a man called Archibald Kirkland who was a weaver also in Strathaven. So on the 21st September 1838 Robert Golder (1816 - 1893), my father and 4th son of James Golder got married to Margaret Fleming of Hills Farm, Parish of East Kirkbride and by their marriage 6 children were born viz: Helen (1840 - ??? ), James (1842 - 1867), William (1844 - 1924), John Angus (1848 - 1940), Janet Gardner (abt.1850 - 1933) and Agnes Young (1852 - ???). Helen was born in 1840, James in 1842 then William was born in 1844 all in Strathaven then came to Govan 11 March 1846. 1858 brother James went to sea as an apprentice with Captain MacIntyre in a threemasted ship called - Alfred The Great-, sailed from London for New Zealand. Brother James Golder was wrecked at Torcross Point, North of Ireland in Taycastle with all hands on 6 Jan 1867. James was interred on Thursday 17 January at Govan in 1867. I was the only one that left Glasgow on Thursday 10 January to claim the body of James at the station of Cushendun. The Grange Farm is up Latham Road west of where Great Grandfather resided for many years and fathers uncles was or grandfathers sons were all weavers. Trade being good then as there was good money to be made. Farmers sons were sent to learn the weaving about year 1790. Robert Golder (Cooper) Sandford, late church officer of Govan U.P. Church born 27 May 1816 at Edinburgh Castle, 4th son of Sergeant James Golder, died at Sanford, Strathaven on 29 April 1893, interred in Stonehouse. 5 breaths belonging to the Duke of Hamilton gave William Golder of Grange Farm. (Note: This I think refers to lairs in Strathaven Cemetery and not to how the Grange Farm came into the Golder family - comment made by William Golder (?) when he found this diary). Uncle William Golder (1810 - 1876) went to Wellington, New Zealand in October 1839 and returned on 20th May 1876 in London ship "Lizard" and went to Jarrow, then to Strathaven, then to fathers at Govan where he died on 20 June 1876 and was interred in Strathaven. Quintin Golder (1822 - 1885) died in Jarrow on 25th February 1885 interred at Jarrow. John Golder (1812 - 1888) died at Jarrow on 14th July 1888 interred at Jarrow. David Golder (1825 - 1888) died at Deanston, Perthshire on 25th February 1888 at Deanston. Matthew Golder (1818 - 1887) died 2 January 1889 at Strathaven. James Golder (1814 - 1875) died at Flemington, Strathaven - was the 2nd brother that died - Angus (1827 - 1848) was the 1st brother who died at the age of 21 years of age. Robert Golder (1816 - 1893) died at Sandford 29th April 1893 was the last to die - interred in Stonehouse. ... seemly for the benefit of one of the New Zealand cousins - Alexander - who visited him in Govan after the First World war and before returning to New Zealand to be demobbed. The farm at Grange, situated in the parish of Avondale at one time belonged to Golders was left to William Golder by the then Duke of Hamilton for personal services rendered I don’t believe this to be true based on information that I have since found in Sasine Reports> I am referring to nigh over 200 years ago but beyond that period I have not been able to trace - although I have reason to believe that they originally hail from the Continent further than this I cannot go, as there are no family records to which one can refer to. Reverting to those of them of them at a later period and of which I am able to speak with some accuracy I will refer you to Mr William Golder, the then possessor of Grange Farm who I think inherited the farm about the year 1814 and held it until the year 1820 when he was held liable for the some of 3 or 4,000 pounds I am not quite sure of the exact amount, through his acting as a Cautioner for another party and said party being unable to meet their obligation the burden of which fell upon the aforementioned William Golder and the result of that transaction was sale of Grange Farm and the flight of William Golder to America in consequence which he was declared an outlaw. He never returned to this Country again although he was privileged to be able to communicate with his wife nearly years after through the medium of a Straven man named David Kyle who went to America to seek his fortune and casually met him in a town named Rowchayhom he afterwards described to myself as a well-dressed old gentleman. The above William Golder before he left for America had seen the authorities coming went and hid him in a churn and so endeth this story. 3. Letter from Robert Golder (1816 - 1893) - dated 1876 advising NZ relatives that William (1810 - 1876) had passed away. 4. Letter from Mary Golder dated ??? 6. Photographs of many Golder family members and other related families - overseas etc. 10. Research carried out by Robert Golder from the USA and his extracts from diaries etc. 11. 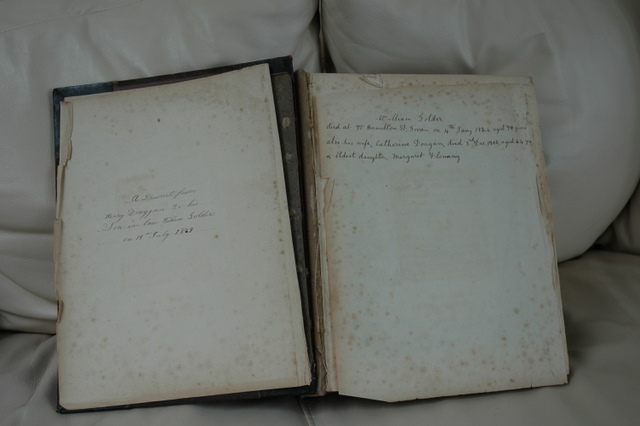 Family bible of William Golder (1844 - 1924) which was presented to him by his wifes father at the time of their marriage in 1869. I came across an early photo of Wellington that was taken in 1863 that mentioned on the right is "Golder's Hill" what is now Hill Street. "The records show the acquisition of land, on what was then known as Golder's Hill, by gift and purchase, virtually all of which still remains in the church's service. Golder's Hill included the town acre published by Bishop Viard as well as the land donated by Henry Petre. The name was derived from an estate in Hampsire, which had been the original home of George Samuel Evans. He was an early settler whose name is associated with Evans bay, an enthusiastic supporter of Wakefied and a vigorous advocate of settler rights. Amid some controversy, the name was later changed to Eccleston Hill, by which it is now known, to commemorate the birthplace of another one-time local resident, Richard John Seddon." I have recently made contact with Kate in Canberra, Australia who is down the Charles Golder (1846 - 1900) line. Charles appeared to be an unusual character and was referred to as the "The Prophetic Jeweller and Mystic writer". Charles eldest daughter Mary Golder married a William John Crichton and one of their daughters, Joyce, married a Vic McCormack. My contact down this line is my 3rd cousin once removed and we have shared many emails and photos. Kate tells me that approx. 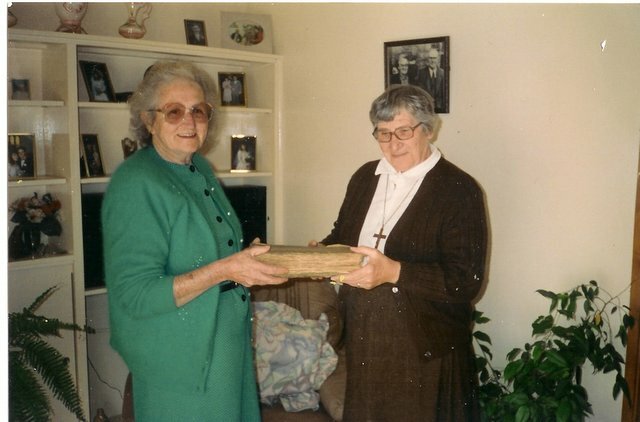 10 years ago her mother Joyce handed the original Golder family bible to Sister Bertrand with the understanding that it was going to the Golder Cottage in Upper Hutt. As yet this has not been the case so I assume that Sister Bertrand still has it. I am most interested to know if the bible contains any family history information in it and when it will be handed over to the Cottage. I am also interested to find out if any more information about William (1810 - 1876) or Charles down this line, as this could be important for Dr. Brian Opie in his studies on Williams poetry. My sister has advised me that the original bible may have been handed to Agnes Veronica Golder (1911 - 2003) who then gave it to her daughter Maureen Golder ( ? - ? ) who in turn gave it to one of her two sons that live in Wainuiomata with the intention of it being handed over to Golders Cottage. This does not seem to be the case and we therefore dont know where it is. I have received today, 3 October 2006, the family bible of William Golder (1844 - 1924) and Catherine Dougan. The bible has been kindly sent to me by Robert McDermott (1933 - 2016), from Scotland, and will be passed over to the Golders Cottage Museum. The bible was given to William Golder in 1869 by Henry Dougan at the time he married Henry’s daughter Catherine. The first two pages contains information about William and Catherine's family. Thanks Robert -	much appreciated. An instrument of sasine (pronounced 'say-zin') is a legal document that records the transfer of ownership (usually a sale or an inheritance) of a piece of land or of a building. It will normally detail the names of the new and previous owners and will give a basic description of the property transferred. There will usually be an indication of the price paid for the property. Sasines can also give you information about family history, particularly where an individual is passing land to another family member, or where the family designation is revealed (for example 'John Campbell of X'). Sometimes information given in one sasine will give you clues as to earlier titles in the chain and so lead you back to the earlier history of the ownership of a building or piece of land. I have begun to concentrate on the period 1600 - 1750 and have come across another possible spelling of the family name. This is Gauder, Gouder and Gawder. Based on Scottish naming patterns at that time the possibility is looking stronger with christan names like James, John, William, Robert, Thomas, Janet, Margaret, Quintin, George, Issobel, Bessie and Anna. There are also some of these marriages etc recorded under the name Golder. It is interesting to note that 4 of these marriages married a "Hamilton" girl who lived in Hamilton.